The future looks increasingly bleak for Team Milram, Germany’s only ProTour team, as its chief sponsor Nordmilch AG has confirmed once and for all that it will not continue with sponsorship. Team manager Gerry Van Gerwen was in Bremen, Germany to discuss a possible extension to the company’s sponsorship, according to radsport-news.de, but has come away empty handed. The Dutchman has reportedly been in negotiation with a number of potential replacements for the German milk conglomerate, but as yet has been unable to secure a deal. He nevertheless remains confident that something will turn up. Should the team have to fold at the end of 2010 it would be the first time in more than a decade that there is no team from Germany in the top echelon of the sport. It would mark the end of an era for the cycling boom in the country that was spearheaded by the successes of the Deutsche Telekom team of the 1990’s. Following the Tour de France victory of Jan Ullrich in 1997, cycling enjoyed a huge surge in popularity in Germany, much like that experienced in the United States after the Tour successes of Lance Armstrong. Successive doping scandals in the sport, particularly the confessions of a number of leading Telekom riders including record green jersey winner Erik Zabel and 1996 Tour winner Bjarne Riis, has soured the image of the sport in Germany though. After Deutsche Telekom finally pulled the plug on T-Mobile in 2007, the team reverted to its parent company name of High Road and has since become the US-based HTC-Columbia team. The Gerolsteiner team was not so lucky and folded altogether at the end of 2008; the doping scandal involving many of its most successful riders, including Stefan Schumacher, Davide Rebellin and Bernhard Kohl made the quest for a new sponsor all but impossible. 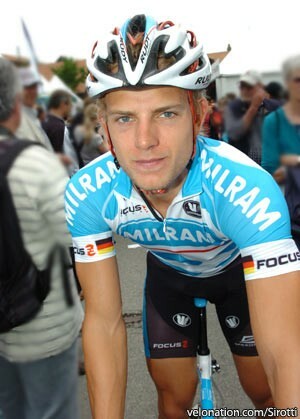 Many of Milram’s riders will likely be already searching for new teams. Sprinter Geral Ciolek has already been linked with a possible move to the Belgian Omega Pharma-Lotto team, and HTC-Columbia has also confirmed their interest in bringing back onto the team.